San Ferry Ann, the title of a 1965 silent British comedy film, is a play on words and refers to the French phrase ça ne fait rien. If I’m translating it correctly–it means it doesn’t matter. The French phrase became bastardised by the British during WWI and ended up as San Fairy Ann–similar to murky buckets (merci beaucoup). San Ferry Ann is a further bastardisation and refers to the ferry that ships British holidaymakers over to France. My impression of French cinema that explores the behaviour of the French on holiday is that the films provide opportunities to the fictional characters to reshape their lives amidst philosophical discussion. At the same time I’ll admit this impression is drawn mainly from watching the films of Eric Rohmer. But when it comes to exploring the British on holiday, the emphasis seems to be on the worst sort of bad, boorish behaviour accompanied by an adverse reaction to foreign food–well a resistance to anything foreign. And of course the underlying question is why go abroad in the first place if you want everything to be the same? The film follows the exploits, trials and tribulations of a handful of British holiday makers in France, and the plot taps into a number of British and French stereotypes, but it’s all great fun and the comic gem makes for a pleasant 55 minutes of nostalgia with a lot of familiar faces of British comedy. The film begins with the British tourists in line to board the ferry to France. There’s a camper van with husband (David Lodge) and wife (Joan Sims). They bring along a set of parents, Grandad (Wilfred Brambell) and his Mrs. There’s an amorous honeymoon couple (Rodney Bewes and Catherine Feller) and a couple of hitchhikers (Barbara Windsor and Ronnie Stevens). Since this is a silent film (apart from a few unintelligible phrases), the comedy is strictly visual. There’s boozing in the ferry’s duty-free pub, seasickness, driving on the wrong side of the street, and more than a few hassles with a French gendarme and a bicycle-riding Frenchman wearing the stereotypical onions around his neck. French toilets also come in for some ribbing. 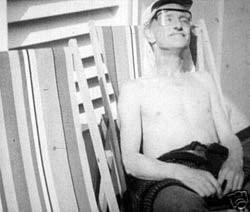 Grandad Wilfred Brambell is one of the best characters is the film–he strips off to sunbathe, finds every excuse to ditch his boring family, and strikes up a hilarious relationship with a former German soldier he meets in a war museum. Of course, since the subject is British tourists abroad, there’s more than one scene in a restaurant, and Joan Sims’s disgust at French cuisine had me in stitches. She’s only happy with a pint of beer and a plate full of chips. Keep an eye open for Warren Mitchell as the snotty maitre d’. I’ve been reading quite a few Zola novels lately, and since I have a fascination with the book/film connection, it was only a matter of time before I started watching film versions of Zola’s 20 volume Rougon-Macquart series. Some months back, I watched Gervaise (1956) which is based on the 7th novel L’Assommoir, and then recently I found a copy of Au Bonheur des Dames (Ladies Paradise), a silent 1930 version of the 11th novel in the Zola series. This film is from director Julien Duvivier. He also made Pot-Bouille based on another novel in the series, but I haven’t found a copy of that with English subtitles yet. While the novel is set in the hustle and bustle of France’s Third Empire, the film is set in the 1920s, and the film immediately captures the atmosphere of a world in flux–a world of horses, carriages and small businesses about to be replaced by cars and huge department stores. The film begins, appropriately at a train station with the arrival in Paris of young Denise Baudu (Dita Parlo), an orphan from the country who’s arrived to join her uncle at his small shop. As she steps off the train and makes her way through the bustling streets of Paris, a plane flies overhead showering leaflets advertising the huge department store, Au Bonheur des Dames. Everywhere Denise turns there’s mention of this phenomenon and when Denise first sets eyes on the glittering lights and the gorgeous window displays, she’s mesmerised. Unfortunately Denise’s uncle invited his niece in better times. The mammoth store Bonheur de Dames, which is directly across from her uncle’s business, has effectively ruined him. His grimy, dingy little shop simply cannot compare to the glittering competition. He’s no longer in a position to employ anyone, and so Denise drifts across the street to the beckoning lights of the Bonheur des Dames and there she’s employed first as a floor model. Soon she attracts the attention of several men: a homely young clerk, the lascivious manager and the owner, Octave Mouret (Pierre de Guingand)…. The film lacks the complexities of the book. Background information on Octave Mouret is absent, and unfortunately the film simplifies the intensity of Octave Mouret’s business acuity. In the novel, he’s a brilliant businessman, and this is detailed in several instances. 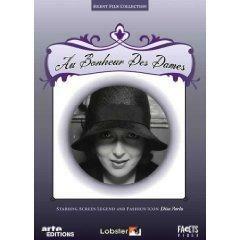 In the film, however, this is distilled down to the essentials and the physical evidence of the Bonheur des Dames. For example, in the book, Octave sets in motion a fierce sense of competition between the shop clerks by giving commissions. In the film however, employee interactions are mostly limited to a brawl in the cafeteria, and a bitchiness between the floor models. Neither does the film address the dilemma of Denise’s divided loyalties, and only hints at the book’s depiction of Denise as a woman with an intuitive business sense that matches Octave’s ambition. Although the film simplifies the book, it is not a disappointment. The film’s strength lies in its depiction of the huge department store. Interior scenes depict a lavish, garish Tower of Babel with distant aerial shots of the customers resembling ants on a giant anthill as they ascend and descend the enormous, central sweeping staircase. Close-in shots concentrate on the madness and mayhem of the shoppers in riot-like scenes. As Mouret plans the expansion of the Bonheur des Dames, neighbourhood shops fall victim to the insatiable appetite of progress, and phantasmagorical scenes depicting the destruction of the old shops are juxtaposed with the expansion of Mouret’s “Temple of Temptation” to consumerism. 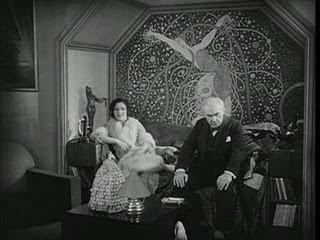 Another scene depicts Octave’s love interest, madame Desforges (Germaine Rouer) sitting in an alcove against the backdrop of a gorgeous art deco mural. Beautiful shots of reflections in mirrors and in glass windows are scattered thoroughout the film. Visually this is a gorgeous film and Dita Parlo’s wonderfully expressive face is complemented with plenty of close-ups. The 1917 film, Father Sergius (Otets Sergiy) is based on a story by Leo Tolstoy, and after suffering through the 1990 version from Paolo and Vittorio Taviani (Night Sun/Il Sole Anche di Notte), I hunted down a copy of this original, silent film. Father Sergius was made after the February Revolution but completed before the October Revolution, and with its anti-tsarist stance, it’s an extremely important film in the history of Russian cinema. Tolstoy’s story was controversial for its implications about the Tsar’s private life and also for the implications about the priesthood. The film was not shown in cinemas until May 1918. Co directed by Yakov Protazanov and Alexandre Volkoff this is the tale of Prince Kasatsky (Ivan Mozzhukhin sometimes spelt Mozhukin). The story begins with glimpses into the character of the young Kasatsky as he attends military training school, and it’s noted that he would make a “model officer” if not for his temper. In adulthood, Kasatsky falls in love with Maria (V. Dzheneyeva) and several scenes show Kasatsky tentatively attempting to establish a relationship with Maria, but unrequited love is in the air as he gazes at her while she gives him the cold shoulder. Unbeknownst to Kasatsky, Maria is the mistress to Tsar Nikolai I, and when rumours begin to fly around the court, the Tsar decides to marry off his mistress to avoid the scandal. Kasatsky is selected as the bridegroom, but is horrified when he learns the truth. Devastated and humiliated, Kasatsky becomes an acolyte, a priest, a hermit, healer and a wandering holy man, and the film follows this process while emphasizing that this choice is Kasatsky’s failure to face his pride. Even as a priest, however, Kasatsky, now the bearded Father Sergius suffers the temptations of the flesh in some of the film’s very best scenes. At one point, he’s locked up with a nymphomaniac in an attempt to cure her (and the inevitable happens) and this sends him spiraling off into solitude. But even here the now middle-aged, unhappy and hysterical Maria finds him. Actor Ivan Mozzhukhin (also known as the Russian Valentino) fled from Russia and settled in Paris, eventually trying his luck in Hollywood, but the end of silent films combined with the actor’s Russian accent ended hopes for a Hollywood career. Mozzhukhin returned to France and died there of tuberculosis in 1939. If you are a fan of silent film, or if you are interested in Russian cinema, then seek out Father Sergius. This really is an amazing film–the sort of silent film in which you don’t ‘miss’ dialogue because the story and the acting are all encompassing. The film includes some incredible scenes–the temptations suffered by Father Sergius, a fantasy-guilt scene, and one scene (possibly the best scene in the film) in which father Sergius stares through a window and glimpses peasants dancing, and the dancing evokes poignant memories of the ball and falling in love with Maria. French director Jean Vigo made only two feature length films (and two short films) before dying at the age 29. L’Atalante is an much acclaimed film–but Zero de Conduite has fallen into obscurity. Upon its release, Zero de Conduite–a short tale of schoolboy rebellion–was banned in France. Perhaps it was judged too subversive–Vigo’s father Eugene Bonaventure de Vigo (AKA Miguel Almareyda) was in his youth, a prominent anarchist. Vigo’s father later abandoned his anarchist beliefs, became mired in some shady political activities, and was murdered in jail. The film begins with the return of various schoolboys to a strict boarding school. The school environment serves as a microcosm of French society–with those in charge, corrupt and dictatorial. The boys live on a diet on beans, and teachers search for sweets, which are then confiscated. The teachers threaten the boys with the dreaded “zero in conduct” if they misbehave, and of course, that principle only works if one cares about such things. It’s not long before three troublemakers–instigators Bruel, Caussat, and Colin–are identified. The film depicts a number of ridiculous rigid rules, and the boys’ reaction to them. While one teacher is tolerant–the Chaplinesque Huguet–other teachers are notoriously strict. One of the teachers even seems to have a questionable taste for one of the boys. After a particularly trivial infraction, the boys lead a revolt against authority on alumni day. In one unforgettable scene, a pillow fight rains feathers down on the rebellious boys as they somersault in a crowded dormitory. The realism occurs in the shots of an idealized nature–apples growing on trees, long shots of a sunflower, and clouds moving across the sky. Even the collectivization is portrayed as a naturally occurring event. While cinema historians find value in this film, I thought it was interesting and was glad I watched it, but it was crude, very unsubtle, and downright chilling when considering what lay in store for the poor Ukrainians. 1932-33 brought the Ukrainian Famine, and the number of victims ranges somewhere between 2.6 to 10 million people, depending on the source. The righteous Kulak hunting posse (and all of its symbolism) is disturbing, and there’s one moment when a peasant glances up at the sky. I half expected to see an image of Stalin amidst the floating clouds, but that sort of thing entered Soviet cinema later. These are still early days…. Anyway, for me at least, there was no enjoyment to be found in the film. Yes, it’s propaganda and so is an interesting relic but the cognitive dissonance between the reality of the dekulakization and this idealized Stalinized version chills the blood. Pandora’s Box–in glorious black and white–was filmed in 1928 and is set in Berlin. As the title suggests, the film explores the unleashed excesses of the human vices. It’s the story of a vaudeville performer, Lulu. She is in the middle of a passionate affair with newspaper tycoon, Schoen. He wants to terminate the relationship due to the small matter of his engagement to someone else. Unfortunately, he doesn’t seem to know that once Lulu has her charming talons in a man, he’s not going anywhere. Schoen often looks narcotized when he gazes at Lulu–he just can’t help himself. He is just one in a series of men that Lulu ruins–one way or another. Lulu is surrounded by men (and one woman) who are obsessed with her. In one scene, men literally pass each other on the stairs. Louise Brooks stars as Lulu. Pandora’s Box was the first time I’d actually seen her in a film, and she was simply amazing to watch. This actress doesn’t need words–she uses her face instead. She conveys every thought running through Lulu’s mind with just a slight change of mood in her eyes, a self-satisfied little smile, or a miniscule shift in body language. Several of the scenes involved large numbers of people (I call them mob scenes)–and the best of these scenes is one that takes place behind the set of a Revue. Everything was so well choreographed. The set is at once so busy–complete madness and mayhem–yet at the same time, the scene is very tightly controlled with expert precision. It’s just an amazing sequence.